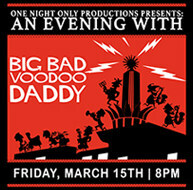 BIG BAD VOODOO DADDY is a live Band like no other. Not only the kings of swing but one of the best live shows you are ever liklely to see. These guys bring a good time vibe & dacenale beats that will leave you feeling magical!